Destiny Bryson, right, of the Highland County Visitors Bureau, is pictured with Susan Valentine-Scott and Stephanie Dunham. 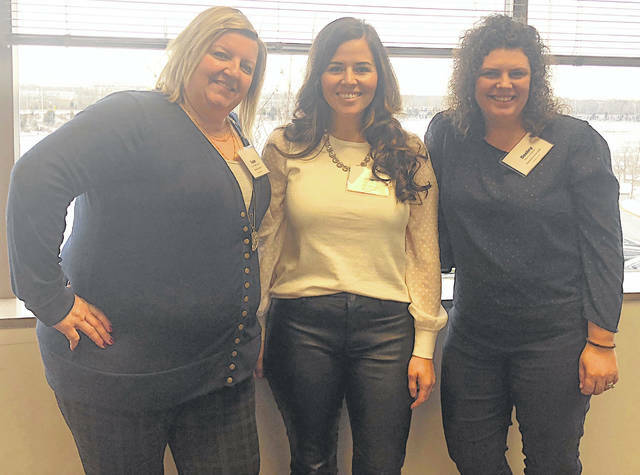 Executive directors Destiny Bryson of Highland County Visitors Bureau, Susan Valentine-Scott of the Clinton County Convention and Visitors Bureau, and Stephanie Dunham of Fayette County Travel & Tourism have been selected to participate in the Ohio Travel Association Leadership Academy. “Participating in the Ohio Tourism Leadership Academy is more than just learning about the Ohio travel economy and the role these directors play. It’s also about strengthening their network with peers and existing leadership. During each session we will discuss critical regional and statewide issues with leaders from across the state in public and private sectors, including nonprofit organizations. Learning occurs through panel discussions, presentations, tours, written assignments and other activities designed to deepen their understanding of Ohio travel industry challenges and opportunities, as well as to inspire them to make a difference in Highland, Clinton and Fayette counties” said Melinda Huntley, executive director of the Ohio Travel Association. The program consists of six classes with session locations taking place in the Greater Columbus area. Classes are held monthly from January through June. Class members have included those from attractions, museums, theme parks, CVBs, local government, state agencies, federal legislators, community development offices, restaurants, hotels and more. This month’s meeting focused on tourism and the economy. The group heard from guest speakers Dr. Jeff Reutter, former director of the Ohio State University Sea Grant Program focusing his presentation on leadership; followed by Matt MacLaren, director of TourismOhio focusing his presentation on the state’s 2019 plans to promote tourism in Ohio to surrounding states. Bryson, director of the Highland County tourism bureau, said that more people are realizing that tourism transfers to economic development, often with affordable marketing costs. In fact, in 2018, the tourism bureau launched a project to come up with a logo and tagline for Highland County’s Visitors Bureau. Entries were accepted from all over the country and audience testing was performed to help with the selection most popular from potential visitors. In the end, “Gateway to Getaway” won the vote of the board members. “We are proud to represent Highland County’s beautiful area attractions, unique lodging and our business partners in the industry. The tagline’s direct message is that the Visitors Bureau itself is the gateway to getaway. When you contact my office, I will help you find the right experiences for you while planning your trip to Hillsboro, Ohio” said Bryson. She added that the bureau also partnered with Ed and Andrew Daniels of The Print Shop in the past year to redesign a user-friendly website, which navigates to all points of interest within the county and also provides a list of area events. Similarly, in Clinton County, Valentine-Scott and her board just rebranded with a new logo and a tag line of “Come Play and Explore.” Scott said that rebranding was needed and they are excited of the direction they are going with the new logo. In Fayette County, Dunham has been on the job for a little over a month, after the retirement of former leader Jolinda VanDyke. Submitted by Destiny Bryson, Highland County Visitors Bureau.